I thought I’d share a very small snippet from Without Fault, Book Nine of the International Men of Sports series I’m writing with the lovely Devon Rhodes. Remember I said very small…lol But I’m posting it to prove to you that it has been started. Can’t give you a time table on when it’ll be done. We’re going to try and get it finished as soon as possible though. Here you go. Percy winced as his mum screeched like a fishwife from the back verandah. What had he forgotten to do now? “I bloody well meant it, young man,” she shouted again. “Don’t you have phones in the stables?” Rebecca asked teasingly. He turned to face his favorite cousin. Heck, she was pretty much his favorite human in the whole world. Her bright smile lit up her face and he couldn’t help but return the expression. “She likes to treat me as though I were still twelve years old,” he muttered. Now, I do believe the pre-order is in March, so you will have to wait a little while longer, but I promise you his story is done and just have to be edited. 🙂 Once I get a cover and a blurb, I’ll post it here for you. I’m working on a new story, which I think I shared a snippet of already titled A Coal Miner’s Son. 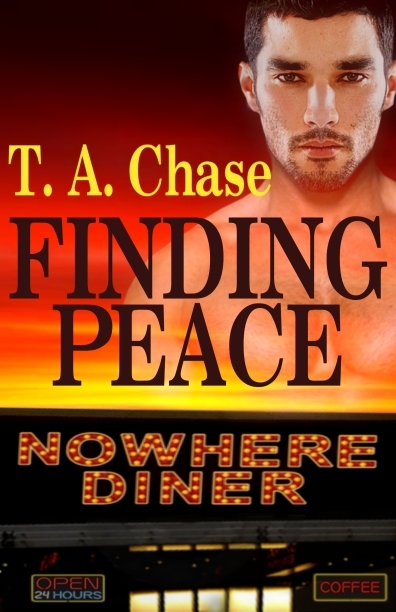 Once that’s done, I’ll be starting Book Two of MV, featuring Lonnie, the lead singer and Cody, Tony’s friend from Home of his Own. Also, Devon and I are starting the 9th book in the Sports series, so hopefully there will be good news on that front soon as well. Hope you all have a marvelous Monday. An Ace in the Tiebreak, Book 8 in the International Men of Sports series, is available now at all 3rd party sellers. (ARe and Amazon) You can check it out here. 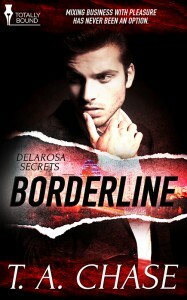 Also, I got the cover for Borderline, which is a re-release at Totally Bound. 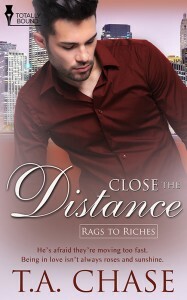 I love this cover, plus there will be two more books in the Delarosa Secrets series coming next year. 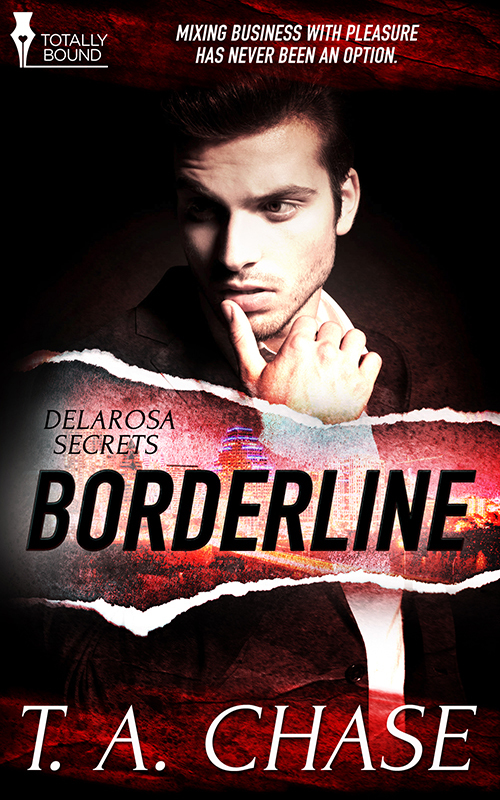 🙂 Borderline will be out in February. Also, I’d like to show you the cover for my short story that is part of a new imprint at Totally Bound. It’s called What’s His Passion?. 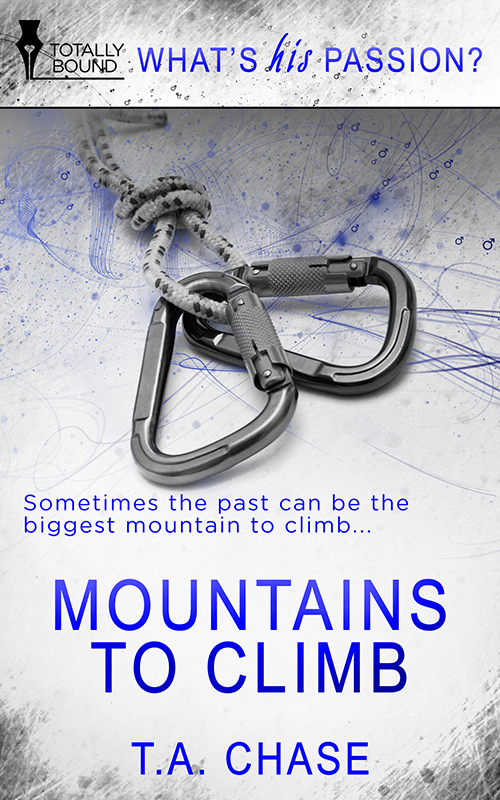 My short story is titled Mountains to Climb and will be out on July 11th. All the stories featured in WHP will be m/m and also at least one character will have something he’s passionate about. 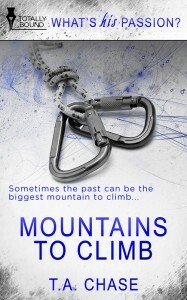 My guy, Jensen, is addicted to mountain climbing. (wouldn’t have guessed it by the title, right? lol) There will be a full length novel some time next year featuring Jensen and Toby again. Plus I have a few other ideas I want to explore that would fit into the theme of the imprint. Sorry I didn’t post an installment today. I wanted to finish Anywhere Tequila Flows by today, so I had to work on that all day. I got it done and turned it. Yay! 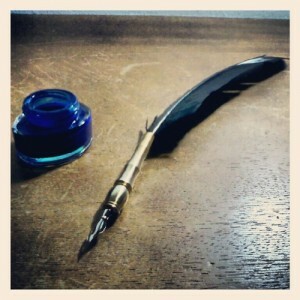 So today, I’ll write both of this week’s installments and get them scheduled. You’ll have some more Bodyguards tomorrow and Thursday. Also, I’d like to share the cover for the newest International Men of Sports series, A Grand Prix Romance. Isn’t it pretty? I hope everyone is having a great Tuesday. I wanted to let you all know that Following His Footsteps, Book 3 in the Rags to Riches series, is up for pre-order at Totally Bound. Check it out here. 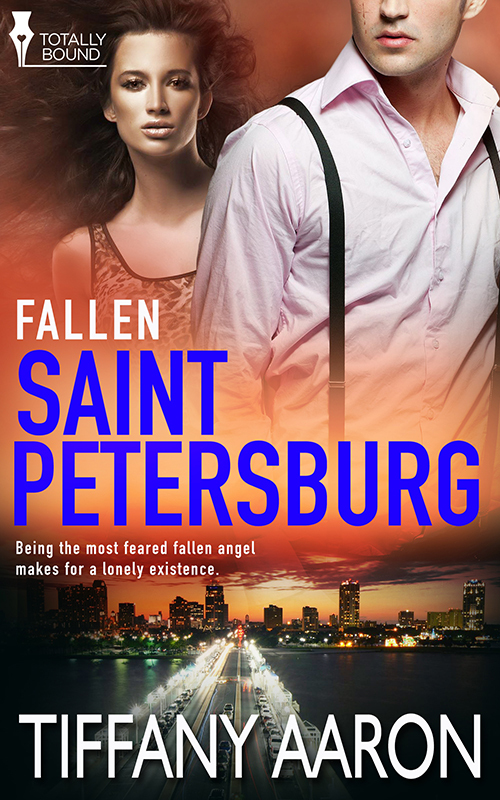 Also, the next book in my m/f Fallen series, London, is available for early download. Check it out here. Plus if any of you live in Chicago, I’ll be at the Chicago Northern RWA Chapter Spring Fling this weekend. Here’s the information on it. There’ll be a book signing on Saturday that is open to the public. If you can make it that would be awesome. It’s been a while since I shared one of these, but I thought I’d post a little snippet from A Grand Prix Romance, book 7 of the International Men of Sports series. 🙂 It’s what I’m working on right now and Devon and I hope to have it finished by the end of the week. Yay! A fleeting thought raced through Johann’s mind. What would happen if Paolo wanted to stay around after the race was over? Could he deal with that? No one else had ever wished to see more of Johann. He rolled his eyes. Sure there had been some who wanted more than Johann had been willing to give them. He’d never been able to imagine himself settling down with a woman, and those were the ones who tended to cling. “Johann,” Paolo called his name. “I could drive this with my eyes closed,” Johann bragged as he slowed down just a little. He could flatter Johann all he wanted, but Johann knew Paolo wasn’t as confident about Johann’s driving skills when it was dark out and Johann was distracted. He didn’t blame him because the winding mountainous roads of Monaco really weren’t the places to not pay attention to the pavement in front of them. “What did you want to ask me?” He brought the conversation back to whatever Paolo had been trying to ask him. The road leading to the house came up on his left and he slowed even more so he could make the turn. Johann drove along until he pulled in front of the stone home. He turned the car off and they sat there for a moment, staring at the facade of the building. “Is your friend Prince Albert?” Paolo asked. After leading the way up to the large wooden doors inset with brilliant stain glass, he smiled at the older man who held one of them opened for them. “Monsieur Wetl, it is good to see you again. When you are finished with dinner, don’t worry about the dishes. We’ll take care of them.” She stepped out of the way to allow Johann and Paolo to enter the room. The small dining room was aptly named. It held an oak table that seated only four at one time. It was covered with an antique lace tablecloth and set with light blue china plates. Crystal glasses and sterling silverware completed the elegant look of the dinner setting. A gorgeous teardrop crystal chandelier hung over the table, but it had been wired for electricity, letting them dim the lightning slightly to bathe the red roses in the centre in shadows. Johann hoped Paolo didn’t think it was cheesy. He had a romantic streak and liked to treat his lovers to special moments. He didn’t get a chance to do it very often, and he admitted it was his own fault since he had a tendency to let them walk away. Yet he readily admitted that most of the problem was his because he hadn’t hung on to them. There was always another race in another country that he had to win. He held out a chair for Paolo who cast him a speculative glance before sitting. After taking his own seat, Johan picked up the bottle of wine to pour out a glass for each of them. Right before he put any in Paolo’s glass, he paused. “Do you like merlot?” He hadn’t thought about the fact that Paolo just might like red wine–or wine in general. First of all, Finding Peace is out now. Yay! Click here to check it out. Also, it’s on sale. 😉 I did add more to it at the end after I took it down from the blog. Isn’t it pretty? This one was supposed to be out April 7th, but we pushed it back closer to the end of April. But it will be out next month. 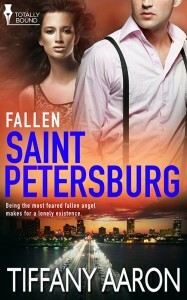 Third, I finished Saint Petersburg, which is Book 8 (and the last book) in the Fallen series. This one is about Lucifer. He plays a part in a few of the other books, so I had to give him his own story. This series has taken me ten years to finish..lmao. It was the first series I ever wrote when I started writing and got published. 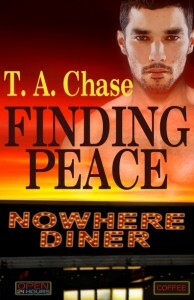 Then I took a detour into writing m/m romance. But when I decided to write both, I figured I’d get the Fallen books done. Yay! 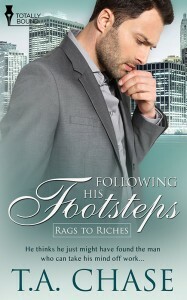 This is the cover to Patrick’s story from Rags to Riches. 🙂 I think the release date for this is in May, but I have to double check…lol. Burning Up the Ice, Book 5 in the International series, is now available at all 3rd party sellers as well as Totally Bound. 🙂 Click here to check it out. I hope you all have a great weekend. Stay warm and safe.